I’m sad to bid farewell to my favorite fruit for another year. This year seemed less full of mango mania but I got aam-ras a few times and sampled all the varieties. 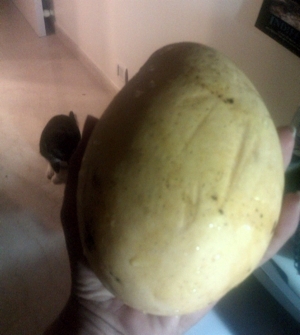 I missed 3 weeks of rain and mangoes this summer but … oh well. Got this giant chaunsa on their way out. I have large hands and this one was … ginormous! And a luscious mouthful from every side. Farewell mangoes … until next year then! No dashboard clock? No problem. 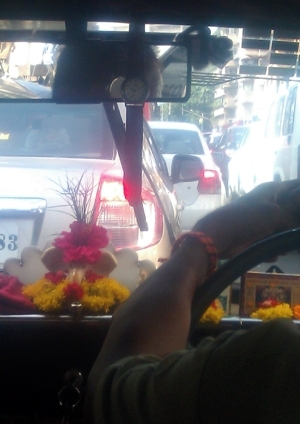 Here’s one for easy viewing for driver and passenger both. Innovative, huh? Like a watercolor, no? 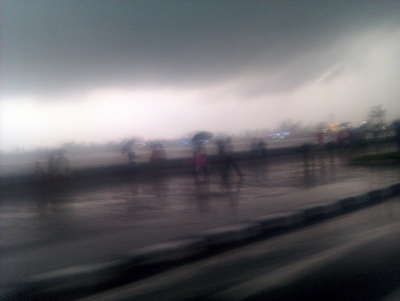 Marine Drive in a sudden gust and storm. Riding the waves, yeah! 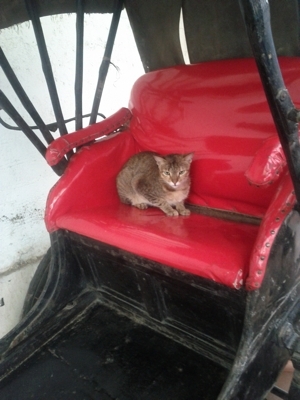 Man and dog moseyed off and the cat finally uncurled her tail and then rolled around to get extra pats and cuddles, looking very much in charge of the carriage. Oh and this one was taken with my new Samsung Nexus S which has no zoom but is pretty good, eh?